The Port of Hueneme’s most historic cargo year, 2013, yielded a significant economic stimulus, reporting 778 new trade related jobs, $5 million in additional taxes and an additional $90 million in Maritime related economic activity as the Port of Hueneme continues to grow as an economic engine for Ventura County and the region. Highlights of the study show that more than 315 of these newly created jobs remain local. 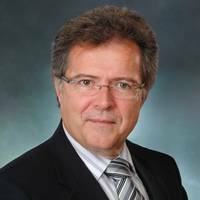 This announcement comes from a just released Economic Impact report for fiscal year 2013 performed by Martin Associates Economic Consulting firm. 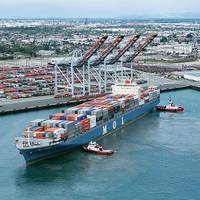 Port Officials and Global Auto Processing Services (GAPS) executed a fifth modification of its 2007 contract extending their agreement for an additional five years through January 31, 2019. The Port welcomed GAPS for the first time in March 2007. Port CEO and Executive Director Kristin Decas noted at the announcement, “In addition to GM and U.S. manufactured Honda exports, GAPS partners with logistics provider Glovis USA, (the logistical arm of Hyundai/Kia), to handle the Hyundai and Kia family of Korean manufactured automobiles. We greatly value this partnership and look forward to many more years as partners”. 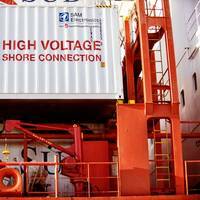 The Port of Hueneme informs that it has performed a load bank test of its recently installed substation making the Port ready to provide a reliable, steady source of shore-side power for ships at berth. 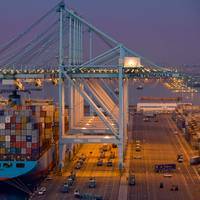 With the passage of AB 32 by the California state assembly, programs were put in place to allow ships at berth in California ports to turn off their more polluting marine engines [cold ironing] dramatically reducing greenhouse gas emissions. The Port’s just completed project “represents a giant leap forward for us and the community” said Port CEO and Director Kristin Decas. Port Officials and Wallenius Wilhelmsen Logistics (WWL), on the eve of WWL’s 26th anniversary at the Port, executed a fifth modification of its 1991 contract extending its agreement for an additional five years through December 31, 2018. 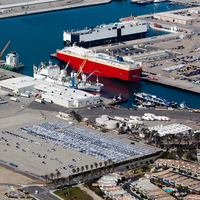 Wallenius Wilhelmsen ships first began calling at the Port of Hueneme in1987. 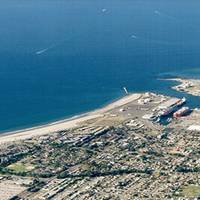 In 1991, WWL established Pacific Ro-Ro Stevedoring (Pac-Ro) to handle autos arriving at the Port and Pacific Vehicle Processors (PVP) as part of a further expansion of the company’s logistics capabilities. WWL has been instrumental in driving the Port’s economic recovery and growth. Harbor Board President Jason Hodge said, “Wallenius Wilhelmsen Logistics is a vital long term community partner and a significant economic engine. 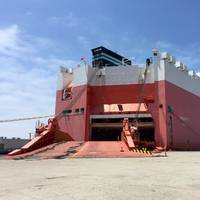 Port Officials and BMW of North America, on the eve of BMW’s 26th anniversary at the Port, executed a fifth modification of its 1987 contract extending their agreement for an additional five years through December 31, 2018. 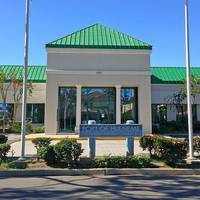 Said Harbor Board President Jason Hodge, “BMW’s Vehicle Distribution Center is a vital community partner and a significant economic engine. BMW’s Port manager Mark T. Port CEO and Executive Director Kristin Decas noted at the announcement, “26 years represents a lifetime in the maritime community. 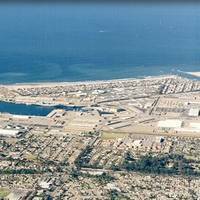 The Port of Hueneme, on the US West Coast, says it realizes another strong year in FY2013 achieving a record revenue total of approximately $13.4 million in Gross Operating Revenue for a 10.4% increase over FY 2012. 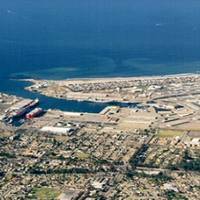 The Port’s CEO, Kristin Decas and CFO, Andrew Palomares submitted the auditor’s report to the Port’s Board of Harbor Commissioners at its recent Commission Meeting. Commissioner President, Jason Hodge, noted "The numbers tell a very positive story about the Port’s financial performance and show our commitment to fiscal responsibility.